WARSAW, Poland -- A new global climate change treaty remains on track to be signed in 2015 after a marathon U.N. negotiating session that saw major emerging powers struggle to preserve a system that has long protected them from obligations to cut greenhouse gas emissions. A series of deals agreed to Saturday evening after a record 38 hours of overtime, marked by fasting, walkouts and two major "huddles" of players hashing out minute but crucial details, includes a landmark plan for a new mechanism to help protect vulnerable countries from irrevocable losses associated with fiercer storms, droughts and sea-level rise. The Warsaw International Mechanism for Loss and Damage does not promise compensation, a so-called red line for the United States and other rich nations. But diplomats from poor countries who have been fighting for 20 years to see the issue taken seriously -- a battle intensified by the destruction wrought by Typhoon Haiyan in the Philippines -- called it a significant win. 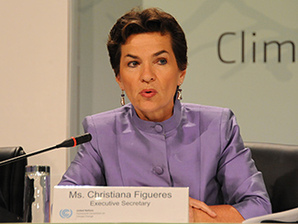 Christiana Figueres, executive secretary of the U.N. Framework Convention on Climate Change. Photo courtesy of Wikipedia. Meanwhile, creative last-minute language about the nature of a new pact that the United States believes should require all countries to cut carbon dioxide emissions after 2020 saved the process from a breakdown and remained vague enough to allow each country to claim its own interpretation. "It was quite a tough negotiation," U.S. Special Envoy for Climate Change Todd Stern said, emerging from the plenary hall in the soccer stadium where talks were being held. "The concern countries have with respect to what a new and uncertain world might look like for them in a post-2020 era ... provoked a lot of concern." Stern said that when the United States, Europe and other countries agreed two years ago in Durban, South Africa, to embark on a 2015 agreement they insisted it be "applicable to all." That, he has argued, will replace the system ingrained in the current Kyoto Protocol in which rich nations take legal obligations and developing countries act voluntarily and with financial assistance. The language finally settled in the Warsaw deal calls for all nations to make "contributions" instead of "commitments." Despite a Saturday-morning attempt by India and China to insert the strongest possible language maintaining the divide between categories of countries, the agreement pushes into the future decisions about how nations with different levels of development will handle new obligations to cut carbon. Stern said the Warsaw deal does not further crumble the so-called firewall between rich and poor countries -- but it also does not build it back up. "I would not say it was knocked down more. I would say the issue is more joined now than it's ever been," he said. About changing the wording to "contributions," he said the United States was "perfectly comfortable" agreeing to commitments, but "In order to get a pretty clear decision ... it made sense to go to that other word. I don't think it makes a great deal of difference." E.U. Commissioner for Climate Action Connie Hedegaard agreed. "It's not that bad to have another word, which is equal to all, and that of course is what the big fight has been. All the drama and all of the emotion are around this thing, which was the main issue: 'Can we not reinstall some kind of firewall?'" she said. Yet, according to Indian Environment Minister Jayanthi Natarajan and Chinese lead negotiator Su Wei, the Warsaw talks changed nothing. "To be very frank, the process continues to be 'under the Convention,'" Wei said, using the U.N. code words that in the world of climate negotiators are understood to mean the classic division of obligations between categories of nations. "Of course the U.S. would have a different view," Wei said, but as far as China is concerned, the principle that rich countries act first to cut emissions while financially helping poorer nations to make voluntary cuts "will continue." 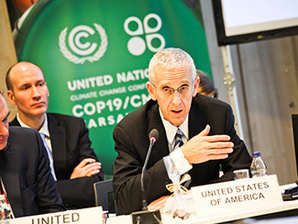 Todd Stern, the United States' special envoy for climate change. Photo courtesy of COP 19. Natarajan blasted wealthy countries like Australia and Canada for backtracking on emissions pledges and said developed countries as a whole have done little to attack the problem. "In my understanding, the firewall exists and continues to exist," Natarajan said. She said the word "contributions," which India fought for, was important because unlike binding commitments, "this is voluntary, something that we take within a country." And, she argued, it should stay that way -- at least for India. "Why should it be changed to 'commitments'?" she said. "I think developed countries should make commitments." The deal also eliminated language calling for a "legally binding treaty under international law," something the European Union and developing countries badly want, but the United States does not. Meanwhile, as developed and big developing countries locked horns over future emissions, some of the world's poorest nations maintained a laser-like focus on the money they say is critical to protecting their communities from extreme weather and slow-onset climate events. In the end, the conference that activists had billed the "finance COP" produced no new money. Poor countries also were unable to force rich ones to say exactly how much they intend to give over the coming years as they supposedly ramp up from $10 billion in current climate aid to a promised $100 billion annual in public and private funds by 2020. Saturday's endgame negotiations nearly collapsed after developing countries -- worried about progress on a loss and damage mechanism and fearful they would go home empty-handed -- suddenly demanded a $70 billion down payment by 2016 on the $100 billion promise. In the end, those countries abandoned their push for specific funding targets after winning key language loosening the relationship between helping countries with the irrevocable losses and damages from climate change with traditional means of adapting to climate events. One of many last-minute huddles among delegates from the United States, Europe and developing countries that saved the Warsaw climate talks from deadlock. Photo courtesy of Kristof Calvo. After an hourlong scrum over a single word -- "under" -- the United States, Nicaragua, the Bahamas and Fiji brokered a deal that left the loss and damage mechanism under an adaptation framework for at least three years but also provided a review of that decision in 2016. "We can live with that," said Paul Oquist Kelley, Nicaragua's head of delegation. "It's not our preferred outcome, but that's what compromise is all about. You reach an agreement that people can live with." With the destruction from Typhoon Haiyan looming in the background of the Warsaw talks and with the Philippines' lead negotiator, Naderev Saño, leading a two-week fast in the hopes of a strong outcome for poor countries, developing countries repeatedly drove home the message that they need more aid to solve problems they didn't cause. "The people in the poorest of the poor countries, we are not responsible for this," said Mohammed Chowdhury, Bangladesh's lead negotiator. "We haven't caused it. So why aren't you willing to compensate us?" He argued that wealthy countries have so far shirked their obligations to cut emissions and provide substantial funding. "Collectively," Chowdhury said, "you are not rising to the occasion." Environmental groups and longtime observers of U.N. climate talks were of mixed minds about the Warsaw results. Paul Bledsoe, a former Clinton White House climate adviser, said the agreement "increased the prospect of a global agreement in 2015" by avoiding different things that the big players -- the United States, China and India -- don't want. "These talks also improved the chances of a 2015 deal by debunking the notion that developing countries are due climate 'compensation' for 'loss and damage' from impacts -- the U.S. and all other developed countries made clear that will never be agreed to. While it wasn't pretty, Warsaw in essence cleared the decks of major impediments to a long-term deal and required each nation to offer a emissions pledge, or 'contribution,' by early 2015, so that the really tough bargaining over emissions numbers can begin," he said. However, some activists were bitterly disappointed that the poorest countries left Warsaw with no certainty about money. 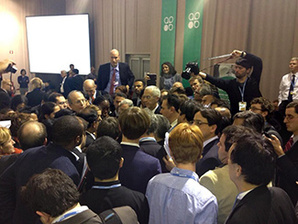 Some called it the "lost and damaged" climate conference. Lidy Nacpil of Jubilee South said: "Instead of establishing a system that could respond to the new climate realities, they've established more talks and given no real resources. It is reflective of a broader outcome that is deaf to the needs of impacted peoples and the urgency of the problem."